This is considered by myself and many gun experts to be the ideal defensive handgun cartridge. Even those who tout other cartridges do not deny the power and reliability of the classic .45 A.C.P. The perceived flaws and weaknesses of this fine cartridge, are a matter of dispute, and in any event, have recently been remedied. The dispute centers around what the purpose of a hand gun should be, and how powerful it needs to be in order to fulfill this purpose. The generally accepted purpose of a handgun is for defense. It needs to be small and light enough to be carried comfortably at all times, concealed if necessary, and it needs to be quick to bring into action. It also needs to be powerful enough to stop an attacker as quickly as possible. We tend to have an attitude, these days, that more, bigger, faster is better, but in some cases this is not true. The most powerful handgun in the world, is likely the Thompson Contender with a barrel chambered in one of the many rifle calibers available for it. This would make a poor defense gun, though it is an excellent hunting tool. The hunter stalks his prey, and chooses the time and place of the encounter, ideally killing with one shot. In a defensive situation, YOU are the prey, and where the aggressor has had time to plan out his actions, you must react quickly, and decisively. This requires a gun of a certain size and weight. This combination of requirements, the need to hit fast, and the need to hit hard, requires some trade offs. A .44 magnum hits very hard indeed, but the recoil is so intense that you had better hit your target with the first shot; by the time you are ready for a second shot you may be hit several times by an opponents less powerful, but faster firing gun. On the other hand you can pop off .22 rounds and keep the gun on target as long as you like, but the .22 is not exactly known as a fight stopper. The .45 fires a large heavy projectile, and it fires it at a high enough velocity to penetrate and do lethal damage. At the same time, it is not so powerful that a reasonably well trained person can not control it in rapid fire. The gun is tried and true, and the section on bullet lethality will go into more detail about the trade offs made and the results achieved. The few perceived shortcomings of the .45 Auto round have been addressed in the last decade or so. One of them is the chamber pressure limit which keeps the 230 grain bullet in the 800 to 900 fps range. I do not particularly consider this to be a handicap, but for those who do, there is the fully supported chamber, and the .45 Super round, along with some others. The fully supported chamber eliminates the major weakness of the original design which left a small section of brass exposed near the base of the cartridge, If pressure limits were exceeded, the case could burst. This is not quite so threatening as a blown cylinder in a revolver, but a burst case, venting hot gasses down into a magazine full of live cartridges, is no joke, particularly when the shooters' hand is wrapped around them. There is also some new brass out there. You can buy .45 +P brass now, which I imagine is stronger than standard .45 brass. There is also the new .45 Super brass, and ammunition. The other perceived handicap of the gun was not really a consideration until the seventies, or possibly the late sixties. The new generation of "Wonder Nines" were nine millimeter autos with double column magazines which could hold twice as many rounds as the .45's seven. This was not a factor earlier because prior to the early seventies there was only one pistol which was so designed, and that was the Browning P-35, also known as the Hi-Power. The gun was expensive, and most shooters thought it better to have 7+1 rounds of a proven, and effective manstopper than the Brownings' 13+1 in a less effective cartridge. In the fifties, the government announced a competition for a new 9mm service pistol to replace the aging stock of "old ugly" M1911 .45 autos. It was also announced that the new pistol should be somewhat lighter than the old model it was replacing. Colt's response was to rechamber the classic M1911 for 9mm, and to shorten the gun a bit. Smith and Wesson responded by introducing the M-39. The M-39 was a double action 9mm, with an alloy frame. The government changed it's mind, keeping the old Colt .45 auto for another three decades, and the contract was never filled. The M-39 was offered to civilians and to police departments, and developed a certain following. The double action trigger had previously only been available on much more expensive guns, as had the use of an alloy frame. In 1973, the gun was modified by widening the magazine well for use of a double column mag, and was introduced as the M-59, the first of a long line of affordable double column "Wonder Nines" which they are still producing. Other manufacturers followed suit, and soon you did not have to be rich to own a double column gun. There were also some tests conducted, at about this same time, which on paper "proved" that the 9mm, in its' lighter, higher velocity loadings was a better cartridge than the "old, slow" .45. These tests have since been discredited, and are covered in more detail in the bullet lethality section. Even for those who still cling to these discredited tests, there is the fact that, as mentioned above, the .45 can now exceed the velocity of the 9mm with new brass and supported chamber guns. The so called magazine capacity deficiency has also been taken care of by Glock, Para Ordinance, H&K, and some other companies which now make .45 pistols with double column magazines which hold from 12 to 15 rounds. I have two carbines, the Mech-Tech, and the Marlin Camp Gun which fire this round. I also have several pistols, the Glock 21, Para Ordinance P-12, Para Ordinance P-14, the S&W M-1917, H&K USP, and the Colt Gold Cup. If you can not help yourself, you can find out about the .45 Super from a real expert: Ace Hindeman. He produces guns, spring kits, modification kits, and has worked up safe loads for the caliber. He is in my list of gun links. The fully supported chamber has addressed, somewhat, the major shortcomings of the old .45, and has encouraged experimentation with, and development of the cartridge. This is very reminiscent of the work done on the .38 Special in the 1920's, and the .44 Special in the 1950's. These developments led to the .357, and .44 magnums. These older magnums are all revolver rounds, and will still fire the less powerful cartridges from which they were developed. There are three presently produced cartridges which could be thought of as improved versions of the classic .45. The first is the +P version of the cartridge, which is a bit less forgiving of some of the older or weaker pistols out there, and is essentially a standard .45 loaded to reflect the newer, stronger guns being produced today. There is also the .45 Super, which can be used in a standard .45 Auto, or at any rate, can be made to chamber in one. Then there is the newest member of the .45 Auto club, the .460 Rowlan. The .45 Super requires, besides a barrel up to the job, replacing the stock recoil springs. I have to admit that My large Para ordinance, is resprung, but really the .45 as it is, almost ideally suits the role of defensive pistol. Unlike the old revolver based magnums, the .45 Super is dimensionally the same as it's parent round, and will chamber in standard guns so caution must be exercised to prevent these higher powered cartridges from being fired in guns not up to them. The new .45 Super, and +P loads begin to enter into .44 Magnum territory, and begin to present many of the problems of that round. The main problem is that of control. A round which generates enough power to push a pistol half way to the sky can not produce a very high rate of fire. The flash and report of such a gun inches from the shooters face does not enhance the accuracy of fire. There is also the discomfort factor which will tend to insure that a gun this unpleasant to fire does not get practiced with very often. The power of the .45 in it's standard loads is low enough so that a pistol of reasonable size and weight may fire it. Cartridges in the .44 Magnum range are always chambered in large, and rather heavy guns. I own a .44 mag Ruger Redhawk, and I like the gun, but would never consider carrying it as a defense gun; it is just too bulky and heavy. The .460 Rowlan is a new development, and is somewhat compatible with the standard .45. Like the older, revolver based magnums, this cartridge uses a case lengthened somewhat over that of the parent round. Unlike the older, revolver based magnum cartridges, the parent rounds do not work well in the magnum guns. There are a couple of reasons for this, and both relate to the differences in the method of operation between revolvers, and automatics. Automatics can be very sensitive to the ammunition they digest. They can also be affected by very small differences in case and round length. The revolver does not have these handicaps, because the chambers are loaded by the shooter, and the mechanism is powered by the shooters finger on the trigger. A round which is overpowered can batter an automatic's slide against it's frame. A round which is underpowered may not be able to work the slide. The ammunition actually becomes part of the mechanism of the gun. Some autos are so sensitive, that the may fail to feed or eject if the shooter holds them improperly. It is necessary for the springs and surfaces of an automatic to be much more attuned to the ammunition used in them, than is the case for a revolver. The other problem with an automatic has to do with using cartridges of different lengths. The ammunition used in an automatic is rimless, and must headspace on the mouth of the case. In practice, auto rounds are made to headspace by the extractor. This makes an automatic much more sensitive to the dimensions of the cartridges used. This is a problem unique to the Rowlan cartridge because, previously, no attempt had been made to fire cartridges of different lengths in an automatic (there are some who might feel the need to remind me of the 9x18 cartridges, and of some experiments with the .380 in the Makarov, but these weapons only worked dependably with one cartridge, and their failure in the market was a reflection of this). A revolver has a slight gap between the cylinder and the barrel. The chamber end of the barrel is widened slightly, and unrifled. This section of the barrel is known as the forcing cone, and it tapers into the rifling, acting as a guide for the bullet after it leaves the chamber of the cylinder, thus the length of the round is not of critical importance in a revolver. The chamber of an automatic is integral with it's barrel. In a perfectly headspaced automatic, the slug will just about be touching the rifling. In this constricted environment, there is no need for a forcing cone, and no practical way to include one. A widening of the area in front of the chamber to produce a forcing cone would adversely affect both the strength and accuracy of the barrel. 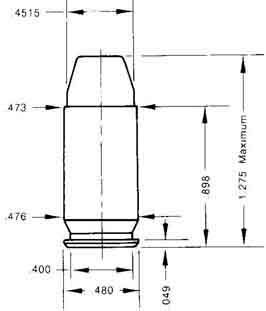 In a barrel chambered for a .460 Rowlan, the use of a standard .45 cartridge would require the bullet to cross a gap in the chamber before striking the rifling. This would adversely affect accuracy somewhat, since there would be no forcing cone to guide the bullet onto the rifling. The .45 Super would likely be my first choice for those who are infected with "power disease" and who don't hear magic in the word "magnum". This round does not have the power of the .460 Rowlan, as can be seen on the table below, but it is still well within magnum territory. The trade off is one between power and flexibility. The .45 Super loses about 100-200 fps to the .460. What it gives back is the ability to use standard .45 A.C.P. ammunition. Externally, the case is dimensioned exactly as the standard .45. Internally, it is quite a bit stronger, particularly at the base. This is not a criticism of the Rowlan; it is a fine cartridge. I consider the Rowlan to be a great hunting cartridge, but it's lack of true interchangability with the old .45 A.C.P. would, to my mind, make it a cartridge unique to itself, rather than an extension of the .45 A.C.P. The exception to this rule would bee the new Dan Wesson revolvers chambered for the Rowlan. These guns should be able to fire the .45 A.C.P., the Rowlan, using half moon, or full moon clips, and probably the .45 Long Colt as well. Listed below are some of the standard loads to be found in the various incarnations of the .45 auto. Some loads will not work in some guns. The .45 Rowlan will not chamber in a standard .45 auto barrel, though a standard .45 will chamber in a .460 Rowlan barrel. A standard .45 will not have the energy to work the spring of a .460 Rowlan. The .45 Super will chamber in anything, and should have the power to work a spring in a .460 Rowlan pistol. The .45 Super should only be used in pistols modified for it's use, with the exception of the H&K USP, and certain models of the 1911 from Springfield Armory, which will fire them without modification. Going in the other direction, Glock has developed a new shortened version of the 45 called the 45 GAP. The main difference between the GAP, and the standard cartridge is the shorter length and somewhat different internal structure of the GAP. You can not simply cut down a standard 45 to make it into a GAP. The GAP also uses small pistol primers rather than the large ones of the standard 45. All differences aside, what is remarkable about the 45 GAP, and the 45 ACP are the similarities. The GAP takes advantage of today's stronger fully chambered guns, and better powders to make the shorter cartridge perform identically to the longer standard cartridge. Browning did the same thing at the turn of the last century with the development of the 45 ACP, which duplicated the ballistics of the much larger 45 LC. What this means for shooters, is a smaller gun which can still pack the punch of the full sized 45. The case length of the GAP is the same as that of the 9mm (19mm, or .775 inches), though the loaded round itself is actually slightly shorter at 1.07 inches.